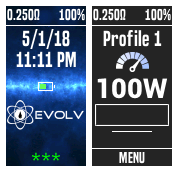 This is an enhanced version of the stock default DNA 75C / 250C theme. A lot of changes and some new screens, exposing the full capabilities of the chip, while keeping with the stock look and feel. Priority and care were given to make this theme as clean, functional and intuitive as possible. Now supports international firmware's Boost and Replay functions, as well as all features of the DNA 250C chip. Hope everyone enjoys!